Margaret Jane Stafford Cummings was born on September 2, 1943 to Othen Leonard “Ben” and Ina Jane Stafford in Tahlequah, Oklahoma. She departed this life on February 2, 2019 in Tulsa, Oklahoma surrounded by her loving family. Margaret grew up in Boatman and then moved to Wichita, Kansas and later to Bakersfield, California. After several years, she moved back to Pryor, where she has lived for almost the last sixty years. Margaret worked as customer service representative for Dillon’s Grocery and later Wal-Mart until her retirement. She attended church at the House of Prayer. Margaret was known as the hardest worker around, sometimes having five jobs at once. She enjoyed sewing, collecting knick knacks, going to garage sales and playing on her piano. Margaret also loved to cook, she was best known for her peanut brittle. She also loved playing games with her grandchildren and telling them stories. Margaret enjoyed comedy shows and she loved watching Law and Order on tv. 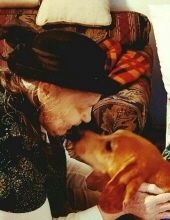 Her favorite movie was “The Patriot.” She loved her little dog, “Doc” her friend and companion, he was so special to her. Margaret was a wonderful lady, she loved everybody and everybody loved her. She will be deeply missed by all who shared in her life. She is survived by two daughters, Cyndi Lynn Altman of Stillwater and Jennifer Hope Hale of Pryor; two sons, Mack James Cummings Jr. of Locust Grove and Othen Donald Dale Cummings of Pryor; her dog, Doc; many grandchildren and great grandchildren, three cousins, Lenise Stafford and wife Shelvay of Salina, Bob Stafford of Locust Grove and Jack Stafford of Tulsa and several other relatives and friends. She is preceded in death by her parents, Othen and Ina and her stepfather, William Weldon Payne. To send flowers or a remembrance gift to the family of Margaret Jane Stafford Cummings, please visit our Tribute Store. "Email Address" would like to share the life celebration of Margaret Jane Stafford Cummings. Click on the "link" to go to share a favorite memory or leave a condolence message for the family.